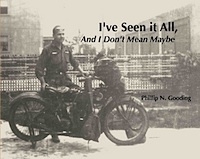 Indian Dealer who worked on Phil's bike. I intended going in swimming this morning in the Merced River, but it is like ice. It runs over and past Glaciers further up the [way] into the mountains. I started out to see the Park at 8:00 a.m. Leaving my camp on the Merced River I took the road to the museum where they have old curios found in the Park. 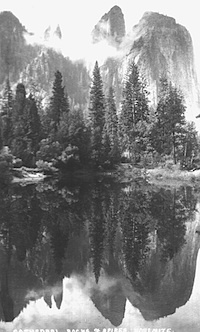 I then took the road up along the wall of the valley to Mirror Lake, which is a small body of water which reflects things like a mirror. I then came back over the Tenaya Bridge past the Half Dome which rises 489 feet above the floor of the valley. I then went to the Happy Isles which is a river rushing over small islands. I then went back to the village past Glacier Point. I toured around and saw the Yosemite Falls, the Vernal Falls, the Nevada Falls, and the Bridal Veil Falls. I am camping on the Merced River again tonight. The altitude of the floor of this valley is 3,950 feet. The half-dome is 8,852 feet. Glacier Point 7,214 feet. The Yosemite Falls fall 2,565, Bridal Veil 620, Nevada 594 and the Vernal 317 feet. I left the park about 5 a.m. and headed for Merced, California. The road was very rough and hilly until I got to Merced. At Wawona, California I turned off and went up into the Forest of Big Trees. They are everything they are cracked up to be and as big as even two of them [have] the road run right through [them]. 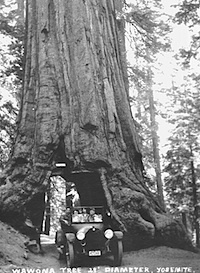 From the Big Trees I went back to Wawoma and then to Merced where I got on the highway to Los Angeles. The road was well paved and I got to Gorman, a small town 60 miles from Los Angeles, and made camp about 5:00 p.m. I covered 345 miles. All day I have been running around seeing the town and seeing the homes in Hollywood and Venice. They are the most beautiful homes in the country. It seems that this city is mostly owned by movie people. I also went to the Indian Agency to see about having my motor overhauled and then went to the California Auto Club and found out about the roads in Eastern California and Arizona to the Grand Canyon. They said the road was passable but dangerous, so I guess I'll take the chance and go across. I am going to have my motor overhauled first. I think I'll stay here about a week or ten days. I did not get up until about 11 a.m. but most all afternoon I was traveling around on buses and street cars seeing the city and Hollywood. In the evening a friend of Miller's and Miller and I, took some girls and went riding out through Hollywood and Beverly Hills passing on the way some beautiful homes and studios. We also went to the Magnolia Hill. It pulled the Nash car we were in with 6 [people] in it at the rate of about 5 miles per hour. It is about 200 feet long. This is the first day I have not ridden my motorcycle since I left Baltimore. I got up about 10 a.m. and went down to the Post Office, but did not get any mail. I then walked downtown and took the car for the beach. The beach nearest Los Angeles is Venice and I went in swimming and stayed almost all day. I then took the car back to L.A. and went to the theater in the evening with a bathing queen I met on the beach. I got up early and took my motorcycle down to the Indian Agency and had the valves ground and the carb cleaned. While they were doing it I went down to the beach and went in swimming. I am going to the theater tonight. I received a letter from Pop and Ma by Air Plane but it did not get here much sooner, about 2 days. I went to Topanga Beach about 10:00 a.m. and saw a real Bull Fight and Western Rodeo. It was sure great and worth seeing. There was about 10,000 people there. It was a regular gambling ranch. They had a Monte Carlo and dice and card games. In the evening I went up to Venice and went in swimming and then watched the fire works until 11 p.m. It was a great day. The best 4th I have ever seen.